Classic tube and solid-state tones with 1176-style compression and professional A/D conversion. By merging the best of UA’s classic analog design with smart modern features and workflow enhancements, the 4-710d is the most flexible microphone preamp in the UA lineup. 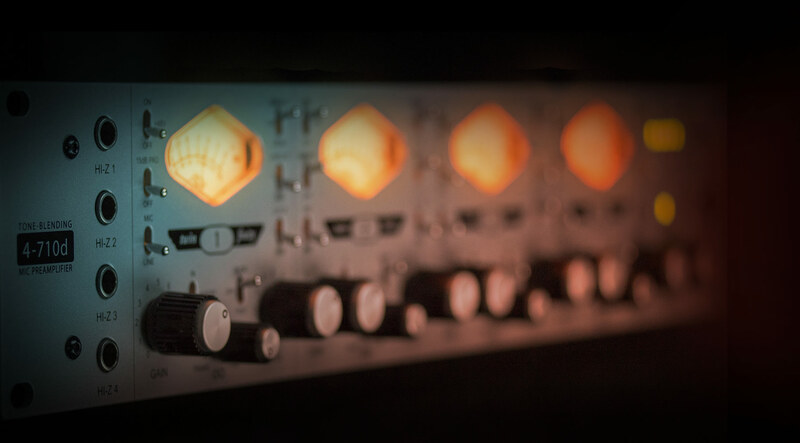 Featuring four high-end mic/line preamps with a unique tube/solid-state tone blending circuit, as well as classic 1176-style compression on each mic channel, the 4-710d also offers tons of digital I/O to expand your setup. At the core of the 4-710d are four channels of tone-blending “Twin-Finity” mic preamps. Each channel offers 100% tube and 100% solid-state signal path, as well as the ability to continuously blend between the two circuits. This gives you tons of textures — from creamy to crunchy — and lets you dial in the perfect amount of tube grit or solid-state sheen. Each of the 4-710d’s four channels features true-bypass 1176-style compression, including specially tuned "fast" and "slow" settings. This enables quick, on-the-fly tweaking for fattening up a vocal, hold a bass guitar in place, or for adding sizzle and texture to synths and horns. With eight analog inputs, the 4-710d is perfect for expanding your studio. Digitized via ultra high-quality 24-bit A/D converters at selectable sample rates up to 192 kHz, the 4-710d easily connects to most interfaces with its dual ADAT optical or AES/EBU DB-25 connectors. The 4-710d has truly brought all my microphones to life! The blend knob really helps dial in the tone and adds great character to each capture. Can't recommend this pre-amp enough! 4710d = fun + magic. I picked it up used out of Nashville used and, I will be purchasing another as, I complete my gear acquisitions for the studio I'm building. I wired it into the signal path using an Apollo Twin into Cubase. Set up was easy and, intergration was seamless and hassle free. I demoed it by plugging a P-Bas straight in and it ROCKED! I then used multiple mic situations! I plugged a tube mic in and ran it heavy to the transiter side and had plenty of headroom and tube love! I then plugged up a TLM-49 and the sonic range was borderline staggering! And then, "just to make sure" I put a SM-57 and a AEA ribbon mic in front of a 50 watt Marshall!...........YEP! ......Buy it Fool! My studio has improved in leaps and bounds with the addition of the 4-710d. Not only an 8 channel extension for my stunning Apollo, the Twinfinity Pre's and 1176's built in have taken things to the next level and beyond. I now want to get a second one and perhaps even a third and forth. I've sold my large format console as this rig will allow me to embrace a far superior way forward. There are issues however. The tube section of pre amp 3 is dead, and when I adjust input levels on the fly during a recording I'm getting nasty scratchy noises through everything indicating that perhaps lesser quality pots have been employed in the design. If this is the case I would be very disappointed. Other than this, the 4-710d is a superb no brainer. I just can't get it to sound bad, whether it's recording choirs, live theatre, or pop/rock. The pre's are big and clean sounding, and the compression circuit is smooth. All that, and mine came with a free quad satellite! Picked this unit up over the holidays and have done quite a bit of recording for vocals, acoustic guitar, and some DI work. I love the tones and smoothness of the preamps. Especially the mix knob between solid state and tube. When recording an acoustic i use two little condensors set in an X pattern about four inches from the 14th fret, and one distant mic, lately an SM7 which was accidentally left open on a sound check. Turns out it adds a lot of nice rich body to to the X mics. Anyway, is use the SS side of knob on the condensor mics and have the SM7 at about 1:00 oclock slightly toward the tube side of the mix. I bought this preamp after finding out about it on youtube. After hearing about it, I was thinking that this would be one of the most versatile pieces of gear that I own, little did I know I HAD NO FREAKIN IDEA You dont know how versatile it REALLY is untill you actually use it in real world situations! I am extremely happy with this unit; definitely worth the investment. The pre's are extremely clean and can be very dirty when you want them to be. Push the front end harder and you bring out a ton of character from the tube and transistor. The compressors are perfect, Period! The 4710 has brought a whole different dimension to my studio and my work. I just purchased this and the Apollo together. The only problem with the tone blending is deciding which way to lean. A sweep across the spectrum yields multiple options that are each enticing in their own way. I've barely encountered the preamps on the Apollo because I'm so smitten with these. Also, the 4-710 connects via lightpipe and adds four mic channels to the Apollo and still leaves all of your line inputs available. I already had a Satellite Quad, so I will likely sell the one that they're offering as a bonus, but all of the UA products work together seamlessly and intuitively. Honestly, with the UA Apollo, 4-710, Satellite Quad, and the UAD plugins, you really don't need anything else but microphones, instruments and talent! I need lots of channels for live recordings and after deciding to move to the Apollo for my mobile rig interface, getting a 4-710d was an easy choice. Fortunately, setup with the Apollo and Logic was trivial. My experience thus far with the 4-710d is still fairly limited - just 2 gigs totaling about 5 hours of tracking. I've been mostly trying to get to know the tube / solid state blend on various sources, as well as what the compressor can provide. On the most recent work, I set up channel one on kick drum and decided to go with no tube in the blend and set the compressor to slow because it let more beater sound through. Channels were used on toms with a 50% tube blend and the compression set to fast. Results were excellent! I just bought the 4-710d to add to my home studio arsenal. As a drummer I want to get the most professional sound possible for my drum recordings. This is it! I use it for my overheads and drum room mikes for the drums, and everything else I record. I am amazed at the warmth and presence this produced. I absolutely love this preamp, I now have a wide range of tonal possibilities to work with. I can hear such a difference with each mic being blended from "Trans to Tube" that it is like having many more preamps and microphones than I really have. I will be using this preamp a lot. Universal Audio is Great Gear ! I'm using this unit as part of a front end a/d set up for my home/portable studio. I'm running it via light pipe into a focusrite saffire pro 40 with the 4-710 being the master clock. It is very simple to set up and even simpler to operate. These pres sound top notch. The 100% solid state setting is clean and clear but not without a little character, the all tube setting is coloured as you would expect and a blend of the two is very nice. So far I've run acoustic guitars, vocals and bass through the unit and been impressed. I'm looking forward to tracking some drums through these pres as they seem quite capable of being driven hard and still sounding good. A great solution for the money for those on a budget. I can't believe how much better my mics sound with this pre amp! I used a Shure "Elvis" mic for scratch vocals during my last session and the singer loved the sound so much we ended up using the tracks in the final mix. I pugged the bass directly into another channel and the bassist was blown away by the tone. It's the world's greatest direct box. The compressors on each channel are an added bonus and sound great on everything I have used them on. The knobs and switches are rock solid and don't wiggle at all. This thing is built like a tank and I'm counting on it lasting for years and years. My current interface doesn't support ADAT but something tells me the UA converters will sound better than the Presonus ones I'm currently using so it may be time for an upgrade. Thanks for making a well designed product at a reasonable price. Well built! Great converters and infinitely variable tone choices! Perfect for the front end of your Digital Audio Workstation as an audio input. The 4-710 includes four amazing mic press, compression and AD, plus an additional four AD converters and clip limiting. The ability to choose between tube, solid state or a blend gives some nice choices for recording. The DI's sound great as well. I found tracking an electric guitar track recently quite enjoyable with recording the DI signal with slight tube distortion along with three other mics for tonal variety. In the end, I used all four channels for most of the tunes on the album. Having the different channels allowed me to adjust later to the songs mood. I never thought previously that I would need four channels for tracking guitar! VERY DISAPPOINTED WHEN I FOUND OUT THESE GREAT PRODUCTS WERE MADE IN CHINA. THERE WILL BE NO MORE FOR ME FROM UA. BUY AMERICAN!!!!!! why does the apollo (dual/quad, not 16) not have an AES/EBU port?? I mean seriously, this would make 100% sense and they would sell A LOT more Apollo/4-710D Combo Packages... It's just stupid... sorry. ADAT is not "the same". One star off for "made in china" - it does not feel as solid as the usa built stuff. Can't say anything about the duration so far. One year in use and not a single problem at all. Awesome piece of equipement: high quality. Very musical compressor, more versatile than you would expect. Also the ADC sounds very transparent, on par with more expensive tools. Will keep this box in my studio forever. Absolutely amazing piece of gear! incredible - all kudos to the team at UA - I have spoken to Bill Junior on the phone he's a great guy running and building a-great company with great products...keep up the good work guys! !